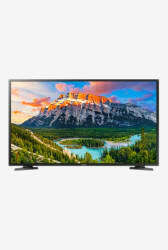 Get home theatre like experience, dynamic sound and USB connectivity with the Samsung 43N5370 108cm Full HD Smart LED TV. Its display resolution of 1920 x 1080 pixels provides crisp and clear visuals. Take full advantage of the Samsung Cloud & seamlessly connect your Samsung smart devices to sync photos. Now you can share your mobile pictures and enjoy it on the TV & access everything with ease with the Smart Browser on Samsung Smart TV. The Samsung Smart TV has Auto Data Backup, which stores pictures and videos in its USB drive. Moreover, it comes with Smart Hub and Built-in Set Top-Box.